In order to provide our patrons with excellent service and facilities, it is important for our clients to adhere to the following rules and guidelines. If you have any questions, please feel free to contact us at your convenience. Reservations are refundable if cancelled with at least twenty-four (24) hours prior to the reservation date. Cancellations requested within twenty-four (24) hours of the reservation date will not be refunded. Guests must register at the front office prior to setting up. We do not allow tents. All guests must register at the front office prior to setting up. Once you register, you will be given a map, space number, and the code to the restrooms and showers. Check Out is 12:00 PM. All RVs must be self-contained, in good condition (as deemed by management), kept clean, and have current registration. Pets are valued members of our families, but require special consideration and care. 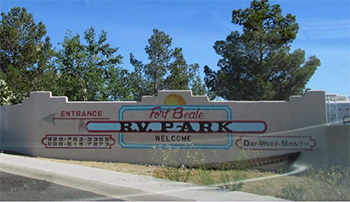 Fort Beale RV as well as the City of Kingman enforce a leash law. The following rules have been established to maintain compliance and guarantee a nice environment for everyone. Dog must be on a leash at all times. Pets may not be left outside of an RV unless the owner or guardian is present. A dog run is located at the far East corner of the park. Plastic bags are provided for your convenience. Should your dog have difficulty making it to the dog run, PLEASE PICK UP AFTER THEM!!! Dogs, cats, ferrets, and other furry friends are not allowed in or around the park office or the swimming pool area. DO NOT: wash pet bedding in the laundry room. Dogs are not allowed in the pool area. Anyone not adhering to these rules will be asked to leave the park without a refund. Please pick up after your dog at all times. For your convenience, the laundry room is open 24 hours per day, 7 days per week. The pool is typically open from 8:00 AM until 9:00 PM, however hours may vary depending on weather conditions. Children under the age of 12 must be accompanied by a responsible adult. No glass containers or food is allowed in the pool area. There is no lifeguard on duty. Swim at your own risk. FROM THE MOHAVE COUNTY DEPARTMENT OF HEALTH & SOCIAL SERVICES: All sewer lines from RV/Trailer to sewer connection must have a minimum of 3" drop; lines lying flat on ground are not acceptable. The sewer line must go straight from the RV/Trailer to the sewer without any bends, and must have a 90 degree bend (fitting) at the sewer end. Quiet hours are from 10:00 PM until 8:00 AM daily. Please respect your neighbors. The speed limit is 5 MPH throughout the park. All vehicles must be parked within your RV site, up to 3 cars per site. There is no washing, oil changing or repairing of vehicles in the park. Clothes lines are not permitted. Towels and bathing suits may be hung in your patio area to dry. There is no storage of items under or around RVs. No campfires are allowed and no use of generators in the park. Sewer connections must be sealed per the Mohave County Health Department. Alcohol is allowed at your site only. DAMAGE TO PARK PROPERTY: Tenant is responsible for damage to utility outlets, park property including, but not limited to office, lounge, restrooms, showers, pool area, gates, etc. LIABILITY: All facilities are used at the tenant’s own risk. The equipment, apparatus and facilities are furnished solely for the convenience of registered guests only and all persons using same do so at their own risk. The management will not be responsible for accidents, injuries or loss of property by fire, theft, wind or other acts of nature.